Ramadan in 2019 starts on 5 May and ends around 4 June. We can’t be more precise because it depends on sighting the moon. So should you venture into Morocco during Ramadan? There’s no reason why not, and the insights you’ll gain into the people and culture will enhance your experience. *The lunar month of Ramadan is a time of fasting during daylight hours and eating and partying at night. Behind the fast is a reminder to Muslims of their commitment to God and a form of spiritual purification. Wish everyone a Ramadan m’barak (a blessed Ramadan). *Exempt from the fast are pregnant or breastfeeding women, small children, those travelling and the sick and elderly. *Fasting means not only no food during the day, but no smoking and no drinking – not even water. *Government offices, post offices, banks and shops open later and close earlier. Opening hours posted outside such establishments do not refer to the Ramadan schedule. *There’s no change to public transport schedules. However, there’s no refreshment services on trains, and cafés at airports are closed. *While you don’t have to fast, and there are plenty of tourist restaurants open for you if you’re in a city, be aware that locals might be feeling a bit desperate by late afternoon – tempers can fray, especially with taxi drivers. *Your guesthouse will serve you breakfast as usual. Non-Muslim visitors are not expected to fast. *The alcohol sections in supermarkets are closed a few days before Ramadan until a few days afterwards. The only place you can buy alcohol is in the bars of large hotels, and even then they often run out of some drinks towards the end of the month. *Many more people that usual wear traditional clothes – new djellabas and babouches abound. *Cafés more often frequented by locals than tourists will be closed during the day, or will be selling sweets and large plastic buckets in which to take them home. Deep-fried sweet pretzels, samoosas and sausage-shaped rolls filled with almond-dotted sesame paste dripping with honey – the sugar-rush from this lot is remarkable. *In the medinas, look out for the trid and waraka cooks, both men and women. They smear fine dough onto a heated dome for trid or on flat heated discs for waraka. The latter is used to make sweets or bistilla (pigeon or chicken pie sprinkled with sugar and cinnamon). Trid is softer and is used for pies. *A cannon is fired each morning just before dawn to warn people that they must finish their pre-dawn breakfast. If you’re very lucky, you might hear the man who walks through the medina with the same message, singing and knocking gently on the doors. *In the public squares you’ll often find fairgrounds that are packed with families in the evenings. They take the opportunity to parade in their beautiful new clothes, enjoy an icecream and give the children rides. They go home to dinner at around 11pm. *Around the 26th evening of Ramadan, on Lailat al-Kaddr, there’s a celebration of the transmission of the Qur’an from God to the Prophet. Children have new clothes and presents, young girls might try fasting for the first time, women have their hands and feet hennaed and there’s lots of party food. Don’t miss the chance to break the fast with the locals in the early evening. After the call to prayer, the café proprietor calls ‘b’smillah’, and everyone tucks in. 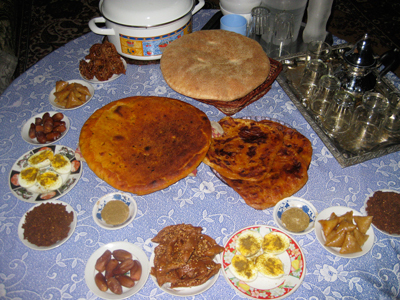 The iftar, or f’touh food differs little from place to place. There’s always harira soup, a delicious concoction of vegetable or lamb stock with tomato paste, chick peas, small pasta, lentils, rice, red pepper, fresh coriander and perhaps some lamb or chicken. It’s served with dates and some honey-drenched pastries called chebakiyya, delicious pancake-type breads, some stuffed with egg and onion, bread, fruit or vegetable juice, hardboiled eggs with salt and cumin and afterwards, mint tea. All for around Dh25 each.